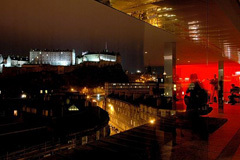 Pop up bars are all the rage right now and the SKY Bar at Edinburgh’s Point Hotel has to be one of the best. On the last Thursday of every month the rooftop SKY Bar opens to the public as a great venue for some of the best cocktails in the City. SKY Bar’s sleek space will literally take your breath away as it has one of the most spectacular views in Edinburgh with Edinburgh Castle so close you feel you could touch it. There’s also an outdoor patio looking out the other way over Edinburgh’s dramatic skyline. SKY stocks a great range of premium spirits and has an elegant cocktail menu featuring classic favourites and “sky” inspired house mixtures – the gin speciality is their own invention, the fabulous ‘Flying High in the Friendly Sky’ a twist on The Aviation. SKY Bar is open on the last Thursday of every month from 6pm until midnight. It’s the perfect Gintime Bar of the Month and we’re giving away free cocktails for April’s event for the first twenty people who sign up.